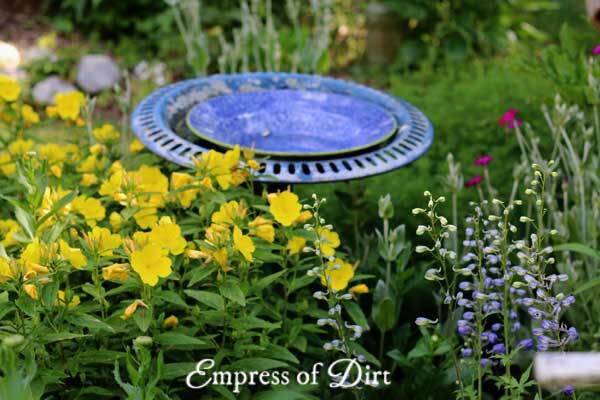 Evening primrose or Oenothera, also known as suncups or yellow sundrops, adds a beautiful burst of colour in the garden. There are also many health benefit claims associated with evening primrose oil, as discussed below. Evening primrose (Oenothera) is one of many flowering perennials in my own cottage-style garden. It started with a single plant, and, over just a few years has spread quite assertively in the sandy soil. 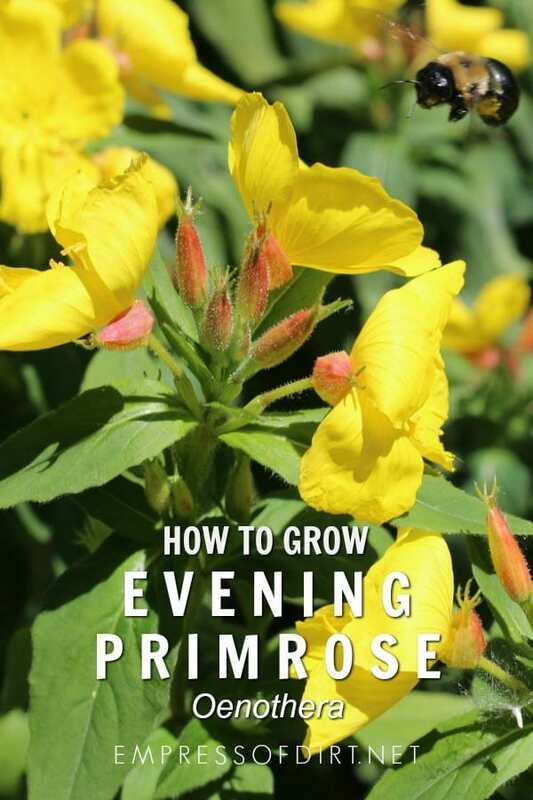 But, unlike horrific invasive plants that spread by root-runners deep in the soil, evening primrose simply expands its girth at the root ball. If I want a wide swath of yellow, I leave it alone. If I want to control it, I both divide the plants and cut back the flowers after blooming (to prevent seeds from forming). There are quite a number of Oenothera varieties (145 species), with different shapes and colours (yellow, pink, white). I am very fond of the Oenothera fruticosa with bold, yellow cup-like flower petals and orange-red stamens. The flower buds also have a gorgeous deep red colour which stands out in the spring garden. 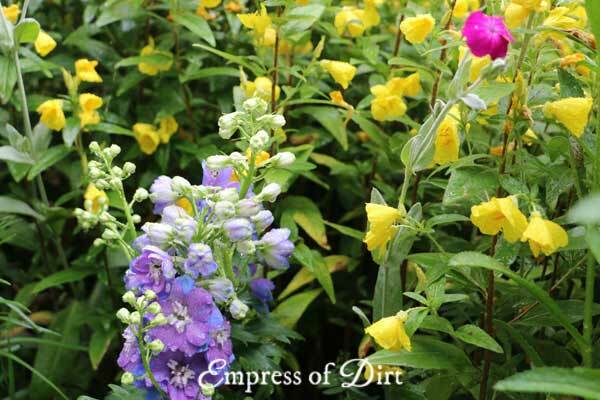 My interest is flowers is all about contrasting colours and textures in relation to the rest of the garden, and evening primrose is gorgeous next to other bold colours including deeper blue delphiniums. Evening primrose oil (made from Oenothera seeds) is widely available in stores selling vitamins, minerals, and supplements. There are many health claims associated with the oil and I have discussed them further in the Frequently Asked Questions section below. Problems Can be invasive. Check before planting. May get powdery mildew or leaf spot. Trivia & Uses Despite the common name evening primrose, they are not closely related to primroses (genus Primula). Many Oenothera flowers open in the evening, attracting vespertine bees that forage at that time of day. There are many claims that evening primrose oil (a fatty acid) is effective in cancer treatments, acne prevention, relief of menstrual symptoms, eczema relief, and hastening child birth labour (and many more) but there does not appear to be research to substantiate any of these claims. The main variety in my garden is Oenothera fruticosa, I believe—I do not have the plant tag to confirm this, which started with one plant five years ago and has become many. I am not a fan of plain yellow flowers but the redeeming quality with this specific variety is the orange-red stamens and flower pods. The stem and foliage are deep green and I love the contrast provided by the yellow and red. It grows between 2-3 feet tall. 1 Is evening primrose invasive? There are annual and perennial varieties and yes, some can be invasive. I find the roots require division each year as they expand rapidly. I also cut the plants back after flowering to stop them from producing and sowing seeds. 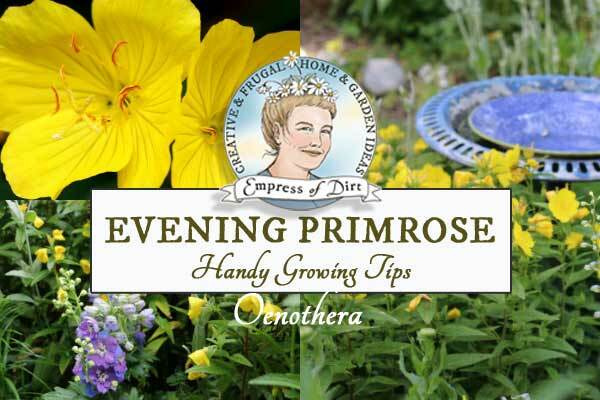 2 Can I grow evening primrose in containers? I think you can grow just about anything in a container so long as you have the right winter storage spot. 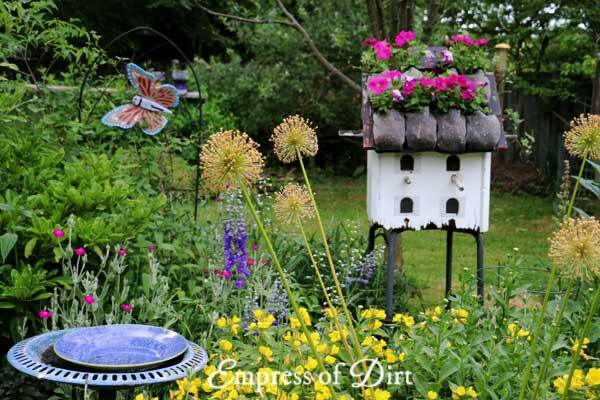 I keep various perennials in containers and put them in the shed or garage from fall to spring. A hand cart / hand truck makes it much easier to move them around. 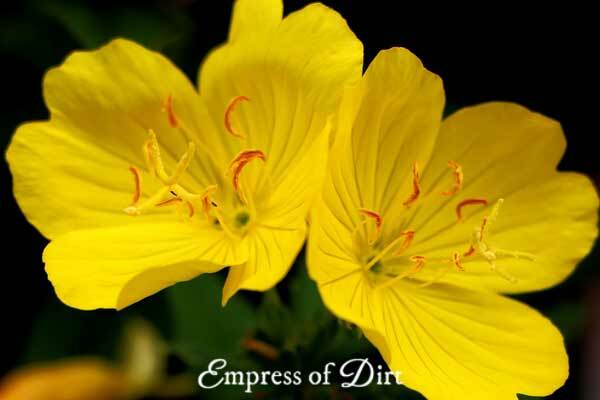 3 Do any creatures rely on evening primrose? Schinia felicita and S. florida moths feed exclusively on the Oenothera genus. Pollination is provided by various moths, bees, and insects, although the structure of the flower limits the number of capable pollinators. 4 Do I need to prune evening primrose plants? 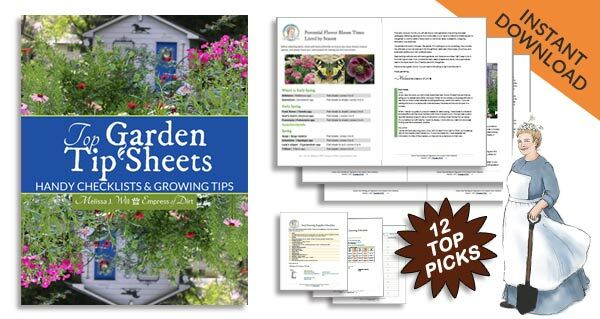 It’s not necessary for basic plant health, but perennial varieties can be cut back after blooming to prevent the forming of seeds if you don’t want them self-seeding. If I know seeds are desired by birds, I do not cut back the plants until spring growth appears. 5 What are the benefits of evening primrose oil? Good question. There is not much evidence available. Evening primrose oil—gamma-linolenic acid (GLA), an omega-6-essential fatty acid—is widely available as a supplement. Some of the health claims purport it is beneficial in some cancer treatments, for resolving skin issues including eczema, psoriasis, and acne, diminishing inflammation in rhuematoid arthritis, and relief of gastrointestinal disorders including irrititable bowel syndrome and peptic ulcers, and more. It was also rumoured for years to help speed up childbirth labour. The list goes on and on. While the primrose oil industry hums along, I have not been able to find any studies substantiating these claims. If you know of any, do let me know.